LG G8 ThinQ, the latest flagship smartphone of South Korean tech giant LG Electronics Co., will be fitted with a Time of Flight (ToF) sensor and touchless gesture control system that will likely win the heart of selfie lovers around the world. 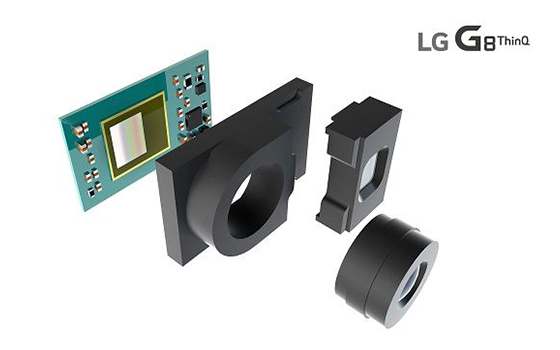 LG Electronics said Thursday that its upcoming G8 ThinQ smartphone is equipped with a ToF sensor that will enable its users to enjoy upgraded camera experiences. The ToF sensor, supplied by German chipmaker Infineon Technologies, enables cameras to measure distance using infrared light and 3D objects, making it ideal for implementation in augmented/ virtual reality applications as well as ensuring seamless operation of facial recognition and biometrics authentication. Samsung Electronics and Apple are also rumored to add the ToF sensor to their new flagship handsets, most likely on rear cameras. Unlike its competitors, the G8 ThinQ will have a ToF sensor alongside the main front-facing camera sensor. The special feature will allow the phone camera to produce more natural looking selfies with people clearly separated out from the images in the background, the company claimed. The company also said its new premium phone will come with an air gesture system, allowing users to operate the phone without touching its screen. LG G8 ThinkQ will be launched at Mobile World Congress (MWC) scheduled to kick off on Feb. 25 in Barcelona, Spain. The Korean electronics giant has been going all out to turn around its smartphone business that has suffered from losses for years. Along with the new flagship G8 ThinkQ series, the company will also unveil its first 5G smartphone a day before the official commencement of MWC later this month.